On Monday, 18th December, the official opening was performed by Dr Mary McAleese, former President of Ireland, of the newly developed Nano Nagle Place in Cork. The Right Reverend Dr Paul Colton (Bishop of Cork, Cloyne and Ross), joined the Most Reverend Dr John Buckley (Bishop of Cork and Ross), and the Most Reverend Dr William Crean (Bishop of Cloyne) in the blessing of the new complex prior to the official opening. 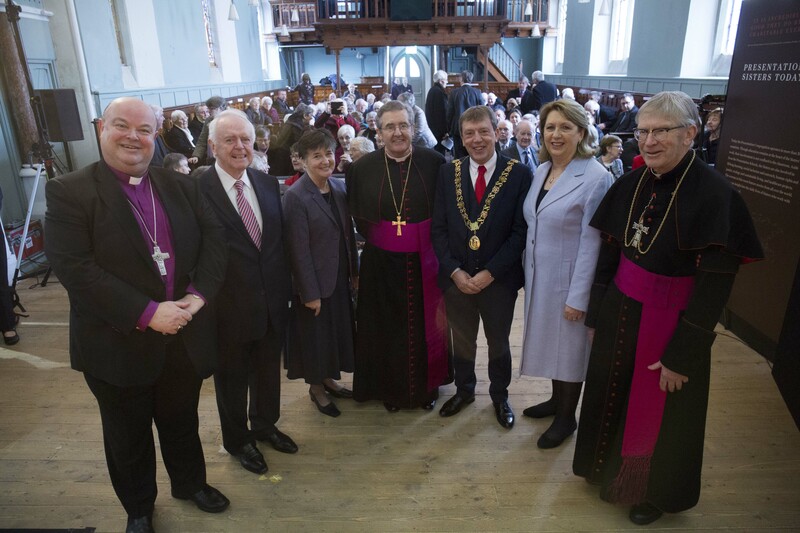 At the official opening of Nano Nagle Place were (l-r) Bishop Paul Colton, Mr Jim Corr (Chairman of the Trust), Sister Mary Deane (Congregational Leader of the Presentation Sisters), Bishop William Crean, Cllr Tony Fitzgerald (Lord Mayor of Cork), Dr Mary McAleese, and Bishop John Buckley. Nano Nagle (christened Honora) was born in 1718 of a long-standing Catholic family at Ballygriffin near Mallow in North Cork. Her home lay in the beautiful valley of the Blackwater backed by the Nagle Mountains to the south. She sensed a special vocation to care for the poor and for their education. By the time of her death in 1784 she had set up a whole network of schools in Cork, with over four hundred pupils in seven parishes. With an eye to the practical, she introduced classes in needlework, lace-making, and other crafts, designed to enable pupils to learn their livelihood and to gain a foothold in society. To a large extent, in the absence of models for this kind of education in Ireland, Nano had to become an educator in her own right. Her abiding conviction: “We must prefer the schools to all others.” To put her schools on a more lasting and more professional basis, she decided to bring Ursuline Sisters from France to teach in Cork. But, for various reasons, the experiment as it materialised did not fit in with Nano’s vision. This led to her setting up her own congregation of religious sisters under a constitution suited to their special vocation of educating the poor. Thus was established, on Christmas Eve 1775, what was at first entitled ‘The Sisters of Charitable Instruction of the Sacred Heart of Jesus, Nano’s preferred title, which was later to become the ‘Presentation Sisters of the Blessed Virgin Mary’ (PBVM), as they are still called. Nano was the Order’s first superior. Today the Order works in more than 20 countries around the world. This entry was posted in Bishop, Church in Society, Community Involvement, Ecumenism, Official Opening, People from Cork. Bookmark the permalink.